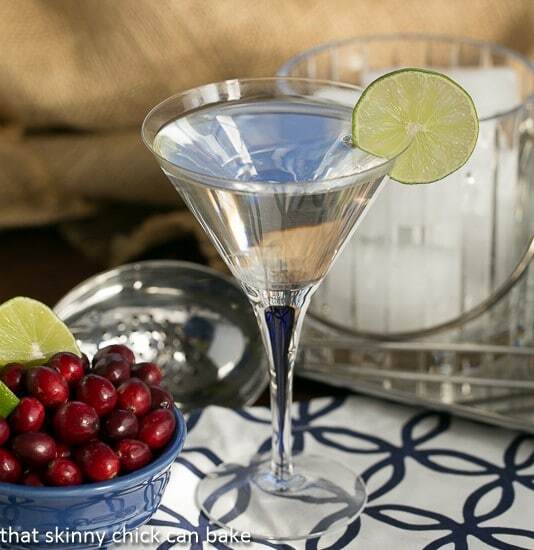 White Cosmopolitans: A smooth twist on the classic made with white cranberry juice. Welcome to Cocktail Day! 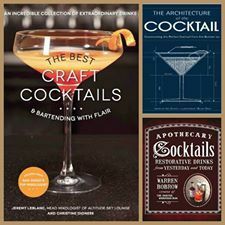 When I entertain, I love to have a festive cocktail, and these exquisite white cosmopolitans fit the bill perfectly. 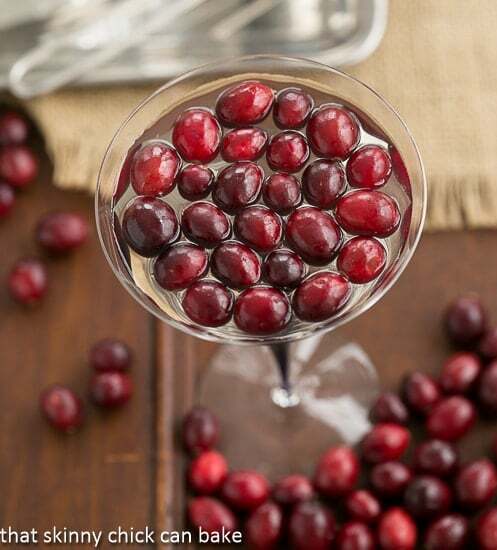 Top with fresh cranberries for a holiday specialty drink! Welcome to Cocktail Day, a multi-blogger event co-hosted by Kim of Cravings of a Lunatic, Liz of That Skinny Chick Can Bake, and Donna of Cookistry. We are raising our glasses to toast you all with some unique and delicious cocktails and mocktails in anticipation of the Big Game and Valentine’s Day. Be sure to bookmark or pin these creative beverages for your next gathering. My real life friends know I get pretty loopy if I drink more than one glass of wine, one of the perils of being a skinny chick. But when I entertain, I love to have a festive, specialty cocktail. These exquisite white cosmopolitans are a twist on the classic cosmopolitan cocktail, which contain vodka, lime juice, an orange liqueur like Cointreau or Grand Marnier, and vodka. For martinis, these babies are so smooth and tasty. Just be sure to use a top shelf vodka and a lovely orange liqueur. The white cranberry juice can be difficult to locate, but worth the extra stop at your larger grocery store. These white cosmos are clear and rather lackluster without a garnish. 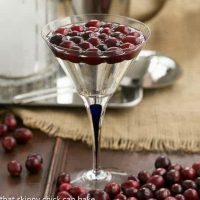 A slice of lime, some fresh cranberries, or even Martha Stewart’s idea of a small white orchid (make sure it is pesticide free) make for a much more festive cocktail! When serving a potent cocktail like these cosmopolitans, make sure to have plenty of munchies available to slow absorption. I’m delighted to be joining up with some of my blogger pals today to share cocktail recipes…just in time for your Super Bowl festivities. I’ve had these White Cosmopolitans in my files for over a decade. I spotted them on Martha Stewart’s website, garnished with an simple, small white orchid. That spectacular image stayed with me for years. Now I’m thrilled to know that these white cosmopolitans taste as marvelous as they look. But beware, as with all martinis, they pack a punch. So please sip responsibly. 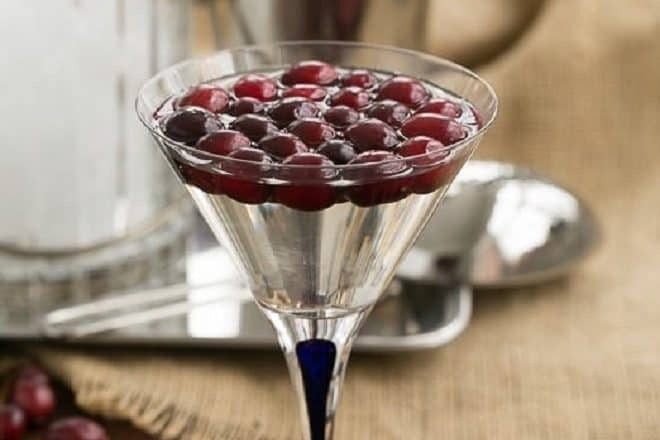 Depending on the season or occasion, there’s always an opportunity to serve a festive, specialty cocktail. 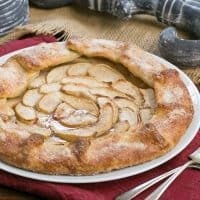 These Peach Bellinis are a Italian classic, a Hawaiian Sunset Cocktail transports you to the tropics, Fresh Peach Margaritas are a delightful summer cocktail, Grand Marnier Mimosas are fun for a celebratory brunch, and my new favorite is this French 75 Champagne Cocktail. 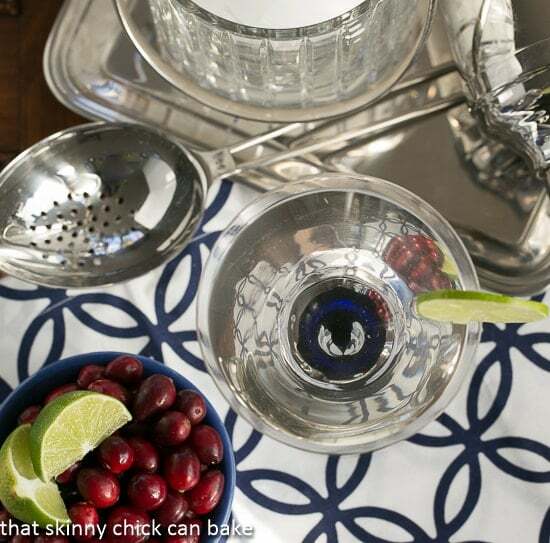 Add juice, vodka and Cointreau to a cocktail shaker filled with ice. Shake well and strain into two martini glasses. 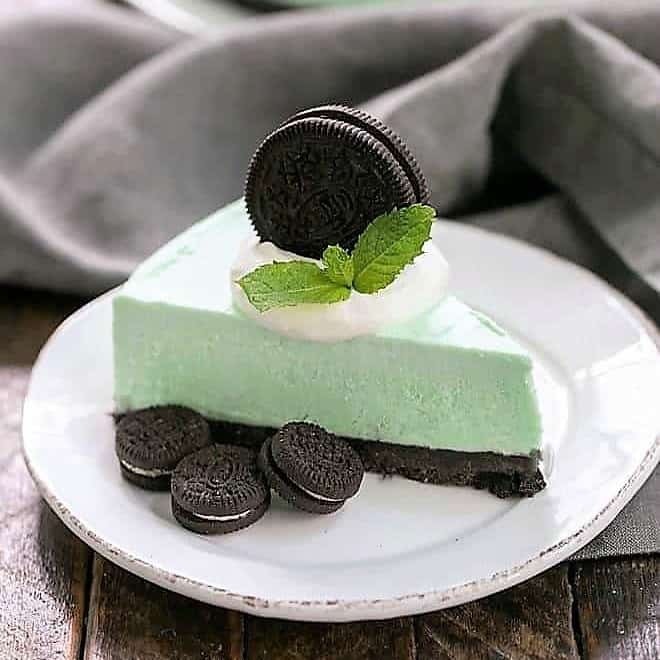 Garnish as desired. Here are all the amazing cocktails from my gal pals. I hope you will find one that tickles your fancy! I can vouch for my white cosmopolitans, my new favorite cocktail. Our sponsors for Cocktail Day are Molecule-R, Page St. Publishing, Race Point Publishing, Fair Winds Press, Microplane, and Not So Simple Syrup. Microplane can be found on Facebook, Twitter and YouTube. Microplane is a division of family-owned Grace Manufacturing Inc., a long-standing company specializing in the crafting of precision thin metal parts for home and industrial use. The versatile Ultimate Citrus Tool features Microplane’s surgical grade stainless steel Fine blade. In addition, the Ultimate Citrus Tool features two decorative garnishing blades in a large (.300-inch diameter) and small (.180-inch diameter) size. The blades are made in the USA and are dishwasher safe. 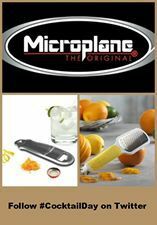 Microplane’s sleekly designed and multi-functional Bartender’s Garnishing Tool easily opens bottles, effortlessly zests oranges, lemons, limes, and other types of citrus fruits, and is dishwasher safe. 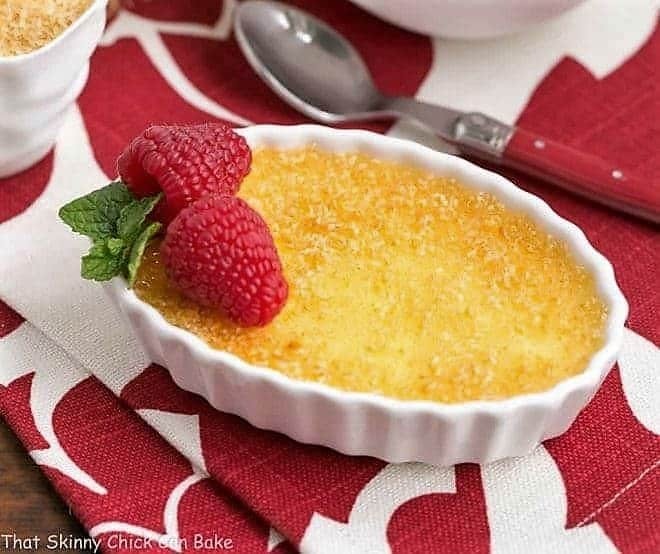 Not So Simple Syrup can be found on Facebook, and Twitter. Not So Simple Syrup is a a small, local maker of simple syrups. Heidi and Barbie’s passion is to create all natural syrups that inspire and stimulate your pension for amazing mixed drinks as well as iced teas and non-alcoholic beverages too. They pride themselves on individual service. When you purchase a NSSS product, you can be sure that it received their personal stamp of approval. 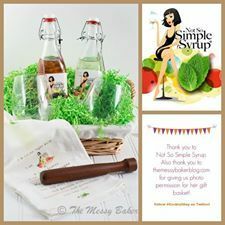 The Not So Simple Syrup Survival Gift Basket has two flavours of delicious all natural Not So Simple Syrup, a muddler for the perfect Mojito you might want to create, two glasses and a bar towel. Honestly, I didn’t even know there was white cranberry juice out there! Such a lovely drink and it certainly makes the cosmo seem less girly this way! I love a good Bloody Mary but my favorite may be the Bengali gimlet at a local tavern. Pina coladas are my favorite! Who knew about white cranberry juice? Fun looking cocktail. I didn’t know there was a white version of the Cosmo. But now I do! Good job – thanks. This is such a lovely cocktail, Liz! I love white cranberry juice because it’s not as abrasive as red; I never thought to put it in a cocktail, but I totally dig it. Thanks for hosting and organizing this event–you ladies outdid yourselves! Cheers! That looks like such a great cocktail to sip on, so pretty. Thanks so much for hosting this fantastic #CocktailDay!! We all so appreciate it!! Your cocktail looks so sophisticated! Love it! Oh Liz your cosmopolitan looks so beautiful! And so naughty as a clear beverage. 🙂 Thank you for hosting #CocktailDay for us! What a beautiful looking drink, Liz. Very nice. 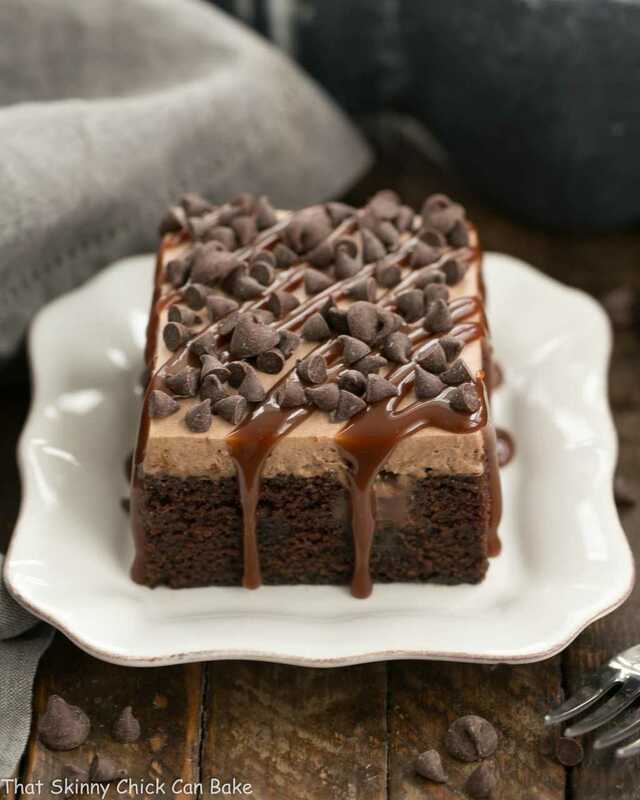 Oh yum. I haven’t had a Cosmo in aaaaages. I love the idea of making an all-white version… the bright red cranberries are such a pretty contrast! My favorite is a Pena Colada. Irish coffee over ice ! I had an “incident” with a cosmo at my 20th high school reunion. Well… perhaps it was more than one cosmo, or it might have even been 3 or 4 cosmos, I’m not quite sure. In any case, I have been cosmo-free for 10 years and this is the first cosmo in that time to turn my head! Love the white cranberry juice, this is supper elegant looking. 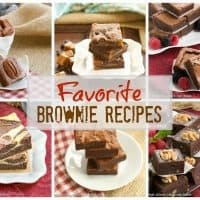 Got to check out all the recipes. 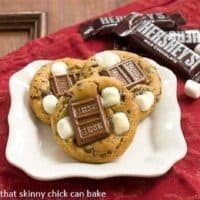 This is definitely going on my Valentine/Birthday dinner for sous chef list! I don’t I think I’ve ever seen white cranberry juice Liz. This cocktail looks so good. I love this cocktail event that’s going on. So much fun to follow! Liz, your cocktail looks absolutely delicious! Yours is the first post I’ve read and now I see what a failure I am! I won’t go into the embarrassing details of my derailment but I appreciate your support and encouragement. 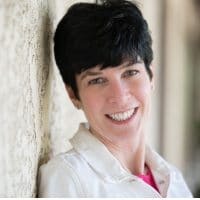 It kept me from jumping off a tall building:) I am seeking help and hope to learn a few things so that I can participate in these things without embarrassing myself or descending into a shame spiral of self recrimination! Thanks for putting up with me! 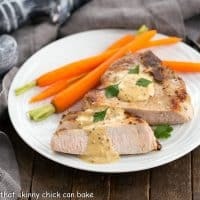 Lizzie, you’ve knocked another out of the park, this looks fab! A classic margarita with really good ingredients! I’ve never had a white cosmo, but I might have to try it very soon. I just keep looking at this and smiling. It’s such a great drink, so pretty. Thanks again for doing this with me. I’m so happy we did this. I appreciate all the help. I just made a cocktail the other day that called for white cranberry juice; so exasperating trying to find it! So I left a message on the Ocean Spray Facebook page and they gave me a link to their store locator where you can search for which store has which product. Of course it was the only store I hadn’t tried! Beautiful cocktail Liz and I now have the goods!